The Falcons take a 14-1 lead before a gritty Forest Grove squad scores five runs in the sixth inning. 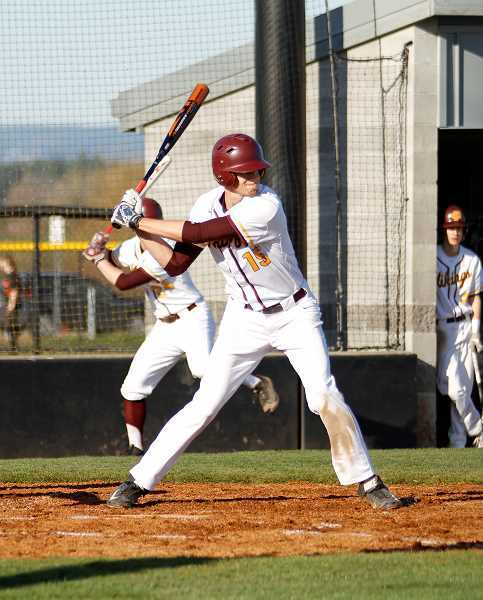 The Liberty baseball team made it look easy in a 14-6 win over Forest Grove Tuesday, March 20 at Forest Grove High School. 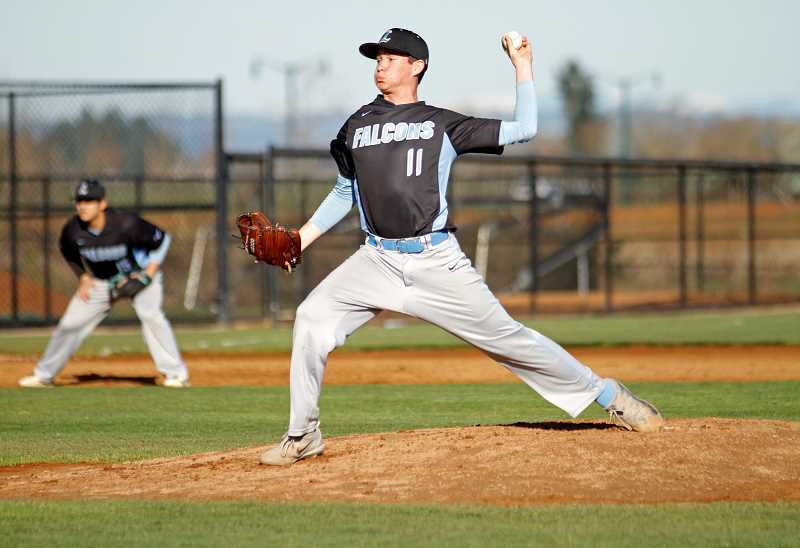 On a beautiful 60-degree day in Forest Grove, the Falcons used a nice combination of timely offense, equally timely plays in the field, and a solid performance on the mound from junior pitcher Ben Ineson to overwhelm a Viking squad still working its way into the season. Ineson threw five innings for Liberty, allowing a single run on just four hits, while walking three and striking out five. Offensively, the Falcons were led by senior Xaven Unciano who finished 2-for-2 with a single, triple, two walks and a hit-by-pitch, while knocking-in four runs. In addition to Unciano, sophomore outfielder Tyler Bickford had three hits and four RBI's. "We came out and swung the bats well, and Ben did a good job attacking hitters," said Liberty's first-year head coach Ryan Raagas. "Things got a little away from us at the end, but we kept our composure and stayed with it." And things did get a bit loose in the end. Forest Grove scored five runs in the sixth off of Liberty relief pitching which allowed four hits, gave up three walks and threw two wild pitches in the sixth inning alone. "We're still trying to figure out the pitching a bit," said Raagas. "But we're getting there." The Vikings struggled early, but got the bats going late during their sixth inning rally, getting multiple hits from senior Brayden McLaughlin and junior middle infielder Jackson Buehler. Second-year head coach Justin Engeseth thought his team appeared a bit nervous in their first home start, but thought they relaxed and executed late in the defeat. "I think some of the kids were a little uptight today and tried to force some things, it being the first home start," Engeseth said. "Once the first couple runs came across I think it lightened the load for them a bit and freed us up to do some things." After a scoreless first inning, Liberty got things started in the second when Unciano led off with a single to left field, then following a Ineson single and a fielder's choice, a Bickford double to right plated two to give the Falcons a 2-0 lead. Following a Forest Grove error and a walk to Joseph Depinto, a Bryan Bafaro single scored Liberty's third run, then a bases loaded walk and the game's first hit-by-pitch spotted the Falcons a 5-0 lead. Liberty got a sixth run in the third when Bickford's second hit and a couple Viking errors allowed the sophomore to score from third base on a wild pitch. An inning later, the Falcons got three more runs on three hits from Bickford, Jake Woodbury, and Michaell Martinez, with help from two more Forest Grove wild pitches, two walks and a hit-by-pitch to make the score 9-0 through four. Forest Grove got on the board in the bottom half of the fourth when Ayden Purcell walked to start the inning, then after advancing to second on a Buehler ground out, scored on a Henry Tonges single to left field to make it 9-1. However, Liberty answered in the sixth, getting five runs, the last three of which came on a bases loaded, two out triple by Unciano to give the Falcons a 14-1 edge. The Vikings showed some fight, getting five runs back in the bottom half of the sixth, but both teams went quietly in the seventh and the Falcons headed back to Hillsboro with a win and a game closer to becoming the team they'll eventually be. "We're really positive and feel good about the upcoming season," Raagas said. "We showed what we're capable of from an offensive standpoint, and if we can get the pitching and defense to back it up, we can surprise some people." Raagas said his squad will lean heavily on junior catcher Bryan Bafaro, who the coach said is just a "really good player," but in addition to that expects a lot from Unciano and Martinez who are new additions to this year's squad. "Unciano is a senior and didn't play last year due to injury and having him back has been huge," said the coach. "Michael Martinez is another guy who's new to our team this year, so we've got some new faces who are injecting life into this group." Meanwhile, Engeseth has his own set of stalwarts, players like Zach Richards and Braydon McLaughlin, who the coach hopes bring both talent and leadership to his club. "We'd like to see Zach Richards become a complete ball player for us, and not just on the mound," said Engeseth. "He was one of our leaders on the mound last year, but this year we're hoping he'll continue to develop at the plate and at first base for us, and with Braydon offer some leadership." Zach isn't the only Richards on roster either, as his freshman brother Max will be contributing behind the plate, as well as in the field as a valuable utility player for the Viks. "We've got a nice mix of young and returning kids, and we're trying to get back to the roots of competition and figure some things out," Engeseth said. "We've just got to do our best to compete."